Please consider donating to the Barefoot Pedals Foundation today. It's quick and easy. Just enter the donation amount and click Donate! “Lord, I have so much to be thankful for. If I die young, I can say I have lived a happy and blessed life. Help me to forget about the possibility of recurrence of cancer so that I can live fully. I want to live without fear. Our foundation’s outreach doesn’t stop with the scholarships. 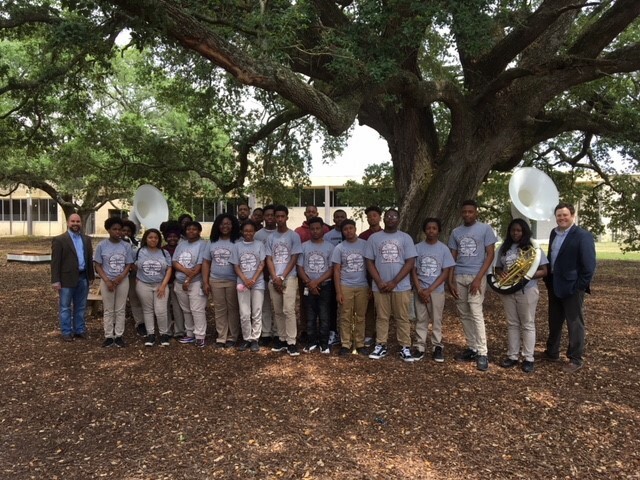 With your support we were able to provide the Istrouma High School Band with the funds to purchase 2 new Sousaphones. Band Director, Reggie Jackson, got the entire band to come out and show their appreciation. Board Members Greg Stevens and Richard Vath are pictured with the Band.